One Flew Over the Cuckoo's Nest, as with many classics, is reliably well-done. In fact, so perfect is its execution that it was almost too perfect - like a Kenneth Branagh movie, where everything exhibits a glowing, slightly alienating polish. Which is not to say this is a pretty film. Instead, like many films of the 70s (what is it about this era, btw? GENIUS was in the air, in India, Italy and the US), it is gritty, totally up our alley and ultimately very sad. It feels, in many scenes, like the other American classics of that era: Easy Rider, MASH (the movie), Bonnie and Clyde… That is, scenes drift over naturalistic conversations; the setting is rough, the characters misfits; and there is an underlying, cynical sense of humanity getting crushed under near-dystopian circumstances. The 70s were, after all, the "Emergency" period in India, the "lead years" in Italy and the OPEC crisis for everyone in the world. One Flew Over the Cuckoo's Nest begins with one typical protagonist of the times: petty criminal R.P. 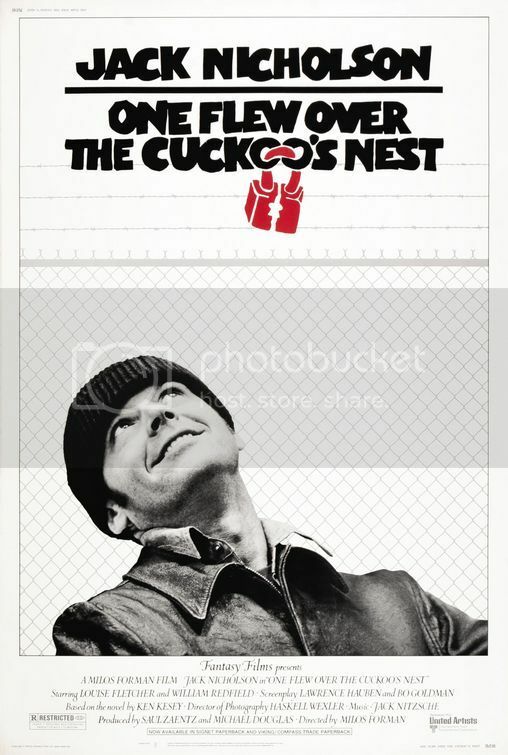 McMurphy (a young, electric Jack Nicholson) who tries to con his way out of a work camp by joining an insane asylum. (Much like Pasqualino Settebellezze!) What McMurphy finds in the asylum, though, is a soul-crushing, dehumanizing atmosphere where the obviously vulnerable are regularly humiliated and everyone is too traumatized to speak up about it. It all feels very grandly symbolic about the dangers of too much civilization (McMurphy being the obvious free spirit/libertarian stand-in) or the banality of evil (especially via collaboration! lots of gut-wrenching shots of characters looking at each other for help, and being unable to give any!). The motley crew of "lunatics" are the clear ancestors of characters like those in The Dream Team or Awakenings or that one season premiere of House (where they basically grafted this movie scene for scene) or, well, many other Hollywood films featuring mental illness. There's the hot-headed Taber (a very young Christopher Lloyd! ), the stuttering lamb-like Billy Bibbit (an incredibly young Brad Dourif! continue singing his praises! ), the vacantly smiling Martini (an unrecognizably young Danny DeVito), the AWESOME and anxious Cheswick (Sydney Lassick), and the stiff, enigmatic Harding (William Redfield). And then, of course, there's the embodiment of pure evil: Nurse Ratched (Louise Fletcher). The film, which begins as a meandering pastiche about the highs and lows of the asylum inmates, soon evolves into a war of attrition between Good (McMurphy) and Evil (Nurse Ratched). And, need we remind you again, it's the 70s. You can guess how it all goes down. Jack Nicholson's performance is a charismatic, iconic one: he is heroic in an almost mythical sense, with the added quirkiness of his jackal-like grin and rascally humor. Everyone else is very strong too; with William Redfield and Sydney Lassick being especially compelling, and Brad Dourif hitting the perfect pitch as the shy Billy, all wrapped up in himself. And that hair! How tender and enormous and adorable. Ken Kesey, who wrote the book on which the film is based, apparently sued the filmmakers and refused to see the film (so said our in-flight entertainment trivia box). We don't know how this compares with the book, but what could Mr. Kesey have to complain about? It's a near-perfect film! "Near" only because, as usual, it hates women: shrewish virgins (Nurse Ratched) combat whores (Jack's friends) for control and attention of men's manlinesses. BIG SIGH OF TIRESOME DISAPPOINTMENT.